Why You Should Choose Our Nursery Pots? - Excellent for medicinal herb and vegetable seeds, basil, mints, tomatoes, peppers, cucumbers, carrots, lettuce, spinach, etc. - Great to germinate and start different types of seeds before moving the plants to larger containers. - The size (2.75 x 3.25 inch) gives plenty of room to get the plants going and ideal to transmit room temperature for optimal root growth. - The nursery pots will simply pop or bend without breaking as you easily remove the seedling. - The seedling pots are thin (1.9mm), which makes it easier to get the seedlings out without damaging the fragile roots. - These plant containers are made of premium PP materials, sturdy for both indoor and outdoor uses. - Stackable, reusable, and recyclable. - Each nursery pots come with drain holes at the bottom. - The holes are not too large to lose soil or too much water, but not too small to be ineffective, either. 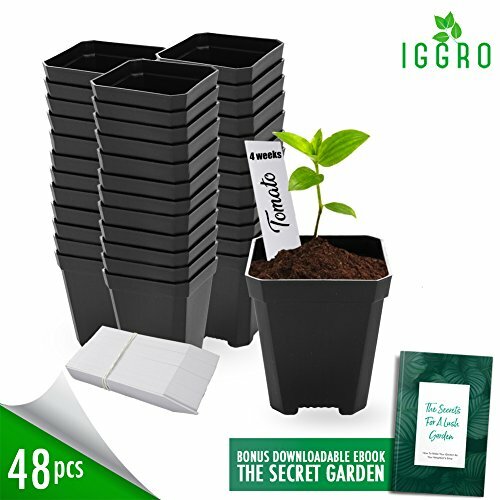 - Includes white sturdy label markers to help easily identify the plant in each seedling pot cell. - These potting pots can also be recycled as containers for stationery, accessories and other small items. Instead of buying individual big pots or big starter trays, seedling pots are more convenient and affordable for every garden. Make your purchase now and be the green thumb you want to be! SEEDLING STARTER ESSENTIALS - These plastic pots for plants are great to germinate and start different types of seeds before moving the plants to larger containers. The size (2.75 x 3.25 inch) gives plenty of room to get the plants going and ideal to transmit room temperature for optimal root growth. Excellent for medicinal herb seeds, basil, mints, tomatoes, peppers, cucumbers, carrots, lettuce, spinach, etc. MAKING TRANSPLANT EASIER THAN EVER - The nursery pots will simply pop or bend without breaking as you easily remove the seedling. The seedling pots are thin (1.9mm), which makes it easier to get the seedlings out without damaging the fragile roots. INCLUDES DRAIN HOLES & LABEL MARKERS - Each seedling pot comes with drain holes at the bottom. The holes are not too large to lose soil or too much water, but not too small to be ineffective, either. 48 white sturdy label markers are also included so you can easily identify the plant in each plant containers. If you didn't become a gardening expert, feel free to return these nursery pots within 30 days to get your FULL refund! REUSABLE STURDY MATERIAL - These potting pots are made of premium PP materials, which are reusable, recyclable, and sturdy for both indoor and outdoor uses. Simply wash these transplant pots with bleach and water solution and let them air dry. They're stackable and ideal to be used again for the next season's vegetables. BE THE GREEN THUMB YOU WANT TO BE - Instead of buying individual big pots or big starter trays, seeding starter pots are more convenient and affordable for every garden. These nursery pots can also be recycled as containers for stationery, accessories and other small items. Plus with every purchase you will also get a FREE gardening ebook. Click ADD TO CART now! If you have any questions about this product by IGGRO, contact us by completing and submitting the form below. If you are looking for a specif part number, please include it with your message.